Score and solo part. Grade 1-2. Dr. Gerald Felker, the arranger, is a former trombonist in the U.S. Army and currently serves as the band director at Cold Spring Harbor Junior and Senior High School on Long Island, New York. 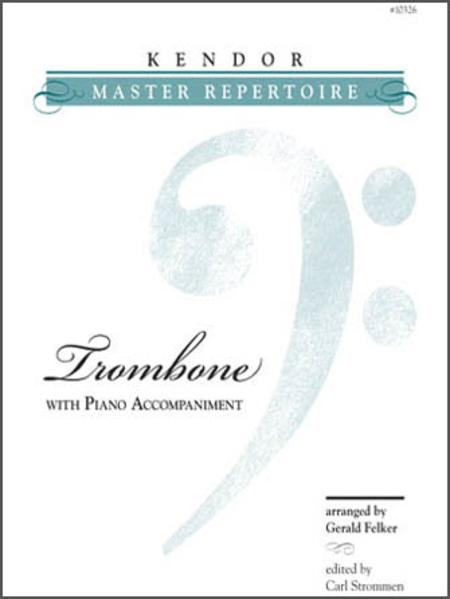 He compiled and arranged this collection of well-known melodies and pieces with piano accompaniment for the young trombonist. These collections introduce important melodies and tropes of Western Art Music in an accessible manner for young musicians. The pieces are arranged in a progressive manner; range, key choice, and rhythms become more difficult towards the end of the collection. The collection can be purchased with the piano accompaniment; however, there are also digital versions of the accompaniment available to download as MP3s. These solos are accessible for the junior-high level musician, especially as a first foray into solo repertoire with piano accompaniment. The range of the solo parts ranges from Low G to f1. Key choices range from F to Ab. It seems that students may benefit from the inclusion of some keys utilizing sharps, as many instrumental music programs require their younger students to be comfortable with keys such as G, D, and A. The pieces utilize solely simple meters; which could also benefit from more variety to provide additional challenge for the progressive student. Overall, there is diversity in terms of style between pieces, which provides the student with musical variety. Articulations are clearly marked throughout the parts; however, there could be more style descriptors (e.g. legato, pesante, etc.) to introduce these terms to young musicians. This collection is a valuable addition in the repertoire as it provides an accessible setting of these commonly heard and utilized pieces and melodies. It should be welcomed by any band director or private instructor of young players who are looking to introduce solo repertoire to their students.